From the Department of Neurology, Weill Institute for the Neurosciences, University of California, San Francisco. Conclusion No major safety signal was observed with rituximab use within 6 months of conception. Beyond the need for monitoring neonatal B cells, these observations support prospectively monitoring a larger patient cohort to determine whether rituximab may safely protect women with MS and NMOSD who are planning a pregnancy against relapses. Women are disproportionately affected by MS and neuromyelitis optica spectrum disorders (NMOSDs), and management of disease-modifying therapies (DMTs) before pregnancy represents an ongoing challenge for neurologists. No safety concerns have been identified with platform injectable DMTs,1,–,3 but discontinuation before pregnancy is typically recommended for the more potent oral and infusible DMTs. Therefore, many women may face a heightened risk of relapses during the period between DMT discontinuation and the potentially protective (in MS4,5 but not in NMOSD6,7) effects of pregnancy. This risk could be further magnified by recurrence of severe “rebound” MS disease activity after discontinuing natalizumab8,–,12 or fingolimod,13,–,16 and in fact these two DMTs appear associated with a higher risk of relapse during pregnancy in the new treatment era. To date, pregnancy and neonatal outcomes in women with MS and NMOSD treated with rituximab are largely unreported.3,20 To bridge this gap, we performed a systematic review of the medical literature, combined with a retrospective single-center case series. 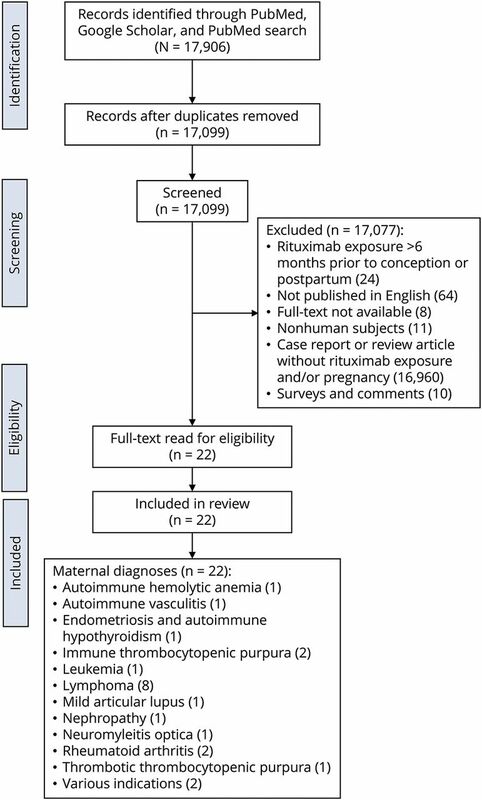 To summarize and analyze the existing literature on pregnancy outcomes in women treated with rituximab for any indication within 6 months of conception through delivery, we performed a systematic review. Original research studies were identified from the PubMed/MEDLINE, EMBASE, and Google Scholar databases. The search terms “pregnancy” and “rituximab” were used in combination to include all articles with the key words for all years (last updated July 3, 2017). Further hand searching of reference lists of obtained articles was performed. This search yielded over 17,000 results; titles and abstracts were screened for relevance, and relevant manuscripts underwent subsequent review. Studies were excluded if they were not written in English, were reviews with no specific individual- or cohort-level data, or if mothers were exposed to rituximab more than 6 months before conception (list of citations available upon request). Twenty-two publications were included in the current review, with 102 mothers exposed to rituximab in the desired timeline (see Preferred Reporting Items for Systematic Reviews and Meta-Analyses flow diagram,21 figure). Data were extracted (G.D.) and checked (R.B.) for individual-level information relating to maternal and fetal outcomes. Most articles were case reports, a few were retrospective, and 1 was a meta-analysis of a database; none included control groups. To identify a cohort of women with MS or NMOSD treated with rituximab within 6 months of conception or during delivery at the University of California, San Francisco (UCSF) Multiple Sclerosis and Neuroinflammation Center, we performed search of relevant medical records. Among 323 patients with CNS inflammatory disorders who treated with rituximab between August 2010 and July 2017, we identified 160 women who received rituximab infusions before the age of 50 years. Their medical records were manually reviewed to identify pregnancies occurring within 6 months of exposure to rituximab. We identified 10 women with at least 1 pregnancy occurring within the selected timeframe. These were cross-referenced with participating clinicians' individual caseloads. Medical records were reviewed to record pregnancy outcomes (delivery or fetal loss), maternal MS or NMOSD disease activity during pregnancy and postpartum (relapses, symptoms, and medications), maternal pregnancy-related and other complications (e.g., preeclampsia), and neonatal outcomes (gestational age, delivery mode, and newborn health status). The UCSF Committee of Human Research approved the study protocol for retrospective analysis of electronic medical record–derived MS data with no patient contact (Ref #13-11686). We identified 102 women who became pregnant within 6 months of exposure to rituximab or who were treated with rituximab while pregnant. Of these 102 patients, 38 were described in case reports or small case series, and 64 were described in a meta-analysis22 (table 1). Medical indications for rituximab treatment included 2 cases with NMOSD, as well as lymphoma, rheumatoid arthritis, and immune-mediated thrombocytopenic purpura, among others. Many mothers experienced successful medical management for their primary condition with rituximab. A total of 74 of the 102 pregnancies reported resulted in live births. In the 41 pregnancies from the case reports and case series, 1 fetal demise was reported at 21 weeks of gestation in a patient with a history of miscarriages23 and 1 stillbirth was reported at 27 weeks of gestation due to placental insufficiency.24 There was also 1 therapeutic abortion and 1 spontaneous abortion in a patient taking methotrexate until confirmation of pregnancy.24 In the larger meta-analysis of the global drug safety database investigating fetal outcomes in patients with rituximab exposure (64 pregnancies with 1 ongoing at the time of publication), 11 spontaneous abortions were reported, as well as 15 medical abortions.22 These mothers were often taking other medications, including methotrexate, an antifolate drug that is often used to treat ectopic pregnancies. Neonatal B-cell depletion was found in 9 of the 23 pregnancies in which B-cell counts were measured and reported. None of these neonates experienced any infectious complications, and none were noted to experience any adverse reactions to vaccinations. All B-cell levels normalized within 6 months, some sooner. We identified a total of 11 pregnancies from 10 patients who became pregnant within 6 months of rituximab exposure (table 2): 6 with MS and 3 with NMOSD, with pregnancy ongoing in 1 patient at the time of data collection. No patients received rituximab infusions while pregnant. No patients experienced relapses between rituximab treatment and conception. Medical complications arose in 4 of the 10 completed pregnancies and included pregnancy-related (gestational diabetes, pre-eclampsia with postpartum eclampsia) and disease-related (blurring of vision and lightheadedness at about 5 months of gestation and worsening spasticity; numbness in fingertips 2 weeks before delivery); neither of the disease-related complications was determined by the treating neurologist to represent a clinical relapse, and neither required additional medications or hospitalizations. Of the 10 completed pregnancies, 9 resulted in term live births, with healthy children (status unknown for 1 as the mother moved out of the area and closer to familial supports for delivery). Most mothers breastfed for at least a few weeks before restarting treatment. One patient of the 8 with data for the full-year postpartum, who carried an NMOSD diagnosis, relapsed postpartum. Rituximab, which seems to reduce relapse frequency in both MS and NMOSD, may offer significant advantages for women with MS and NMOSD who are planning a pregnancy and require ongoing DMT, given that its biological effect extends significantly beyond its pharmacokinetic half-life. Although individual variability exists in terms of the exact half-life of rituximab,27 or of any administered monoclonal antibody, an estimate of effective elimination would require 5 maximal half-lives3 each of 19–22 days or approximately 110 days.19 B-cell repletion occurs in most individuals within 8 months, but in the phase 2 study of rituximab, MS disease activity remained suppressed 1 year after a single course of treatment. However, not enough is known about pregnancy outcomes in women with MS and NMOSD who conceive after rituximab treatment to fully understand the risks and advantages of this approach. Limitations of this literature review include the retrospective nature and small size of the cases series and reports, potential under-reporting, and lack on information on potential confounders. For example, the coexisting use of glucocorticoids, antimetabolites, and other chemotherapy agents could potentially confound any causal role attributed to rituximab for these adverse events. Furthermore, there was little information on other possible confounding variables such as obstetrical or clinical disease histories, which could also influence the pregnancy course and outcome. Prospective evaluation of pregnancy outcomes, including case-control studies evaluating the rates of pregnancy loss or prematurity, as well as longer term information about children's immunologic trajectories, is required to overcome the current limitations and biases. Nonetheless, this review did not identify major concerns that would preclude treatment with rituximab within 6 months of conception in women with demyelinating diseases at risk of inflammatory activity when discontinuing other MS medications before conception. Next, in our preliminary case series of 11 pregnancies in women with demyelinating diseases treated with rituximab within 6 months of conception, none of the patients experienced a relapse before conception or during pregnancy. Those with completed pregnancies did not experience major rebound activity after delivery; only 1 patient (NMOSD) experienced a postpartum relapse (up to 1/3 women with MS have been reported to relapse postpartum). Most of the treated patients breastfed for at least a few weeks before receiving another dose of rituximab. All children were reported to be healthy at birth and to remain healthy at follow-up. Limitations from the current case series include the small sample size and possible bias if some pregnancies in women not receiving primary or obstetrical care in the same hospital system as our tertiary care center were not captured in the patient's medical record. However, given the complex medical decision making that typically happens at the time of conception and delivery in women with demyelinating diseases, it is likely that we identified most of the pregnancies within our rituximab-treated cohort. Furthermore, to date, regular B-cell monitoring in the mother during and after pregnancy and in the neonate has not been routinely performed in our clinic. As decreased neonatal B-cell counts were noted in the systematic review, this information would provide additional insights into the effect of rituximab intrapartum and postpartum and would allow optimization of the timing of rituximab treatment. Finally, there were no patients in our single-center case series who received rituximab during pregnancy, limiting discussion of possible effects of intrapartum maternal treatment and fetal exposure. Currently, to treat women with demyelinating diseases during pregnancy, glatiramer acetate can be used before, and even during, pregnancy; but some therapies commonly used in MS are relatively contraindicated.29 Fingolimod, dimethyl fumarate, and teriflunomide are small molecules that could cross the placenta and potentially cause birth defects. Natalizumab treatment during pregnancy may be associated with neonatal pancytopenia,30 and natalizumab treatment discontinuation can be associated with recurrence of severe MS disease activity.31 For example, in a retrospective study evaluating 22 pregnancies after discontinuation of natalizumab, recurrence of disease activity was noted in 95.5% of the cases, despite little to no activity in the year before natalizumab discontinuation.32 Disease activity seemed more limited when conception occurred shortly after or even before discontinuation of natalizumab, with recurrence of disease activity often occurring 4–6 months after discontinuation. To our knowledge, no data on daclizumab use during pregnancy are available in humans. Like rituximab, alemtuzumab has a pharmacodynamic effect that is far longer than its pharmacokinetic half-life and theoretically could be used in women with MS who are planning pregnancy. However, alemtuzumab-treated patients are at high risk for treatment-related, de novo thyroid and other autoimmune diseases. Because maternal autoantibodies can be transmitted across the placental barrier and thereby can cause disease in the fetus or newborn, treatment with alemtuzumab before pregnancy must be approached with caution. In March 2017, ocrelizumab, a humanized monoclonal anti-CD20 antibody, was approved by the US Food and Drug Administration for both relapsing and progressive MS.33 Its average half-life is 26 days—possibly shortening the preconception therapeutic window relative to rituximab. In an initial report of 9 women whose embryo/fetus was considered “exposed” to ocrelizumab (i.e., here, infusion within 3 months of conception) during the MS clinical trials, pregnancy outcomes included 1 healthy term baby, 6 elective terminations, and 2 ongoing pregnancies.34 Therefore, an unmet need for effective treatments for women living with MS and NMOSD who are considering pregnancy remains. While awaiting prospective pregnancy and postpartum monitoring, the current systematic review and case series provide some preliminary reassurance that rituximab may offer a window of time before conception during which inflammatory activity can be mitigated, without evidence of major adverse effects during pregnancy. Longer term follow-up and a larger sample size are needed to determine the safety of rituximab before and during pregnancy in women with MS and NMOSD, and independent studies will be required to assess the potential benefits and risks of other B-cell depleting agents such as ocrelizumab in this situation. Study concept and design: G.D., J.M.G., B.A.C.C., and R.B. Statistical analysis and interpretation of data: G.D. and R.B. Acquisition of data and interpretation of results: G.D., V.D., L.D., and R.B. Manuscript drafting and revision: G.D., V.D., J.M.G., C.B., B.A.C.C., L.D., A.G., S.H., and R.B. This research was supported by the National Multiple Sclerosis Society Career Transition Award (R.B.). G. Das reports no disclosures. V. Damotte received a travel grant from the ECTRIMS and research support from the ARSEP Foundation. J.M. Gelfand served on the scientific advisory board of Genentech; received research support to UCSF from Genentech; his spouse served on a scientific advisory board of Eli Lilly; is viewpoints editor of JAMA Neurology; consulted for Zosano, Biohaven, and Eli Lilly; and received research support to UCSF from eNeura and Allergan. C. Bevan reports no disclosures. B.A.C. Cree served as an editor of Annals of Neurology; consulted for AbbVie, Biogen, EMD Serono, GeNeuro, Novartis, and Sanofi-Genzyme; and received research support from Acorda, Celgene, Hoffman-LaRoche, MedImmune, Novartis, and Teva. L. Do reports no disclosures. A. Green served on the scientific advisory board of MedImmune, Novartis, Inception 5 Biosciences, and Bionure; served on the editorial board of JAMA Neurology and Neurology; holds a patent for Remyelination molecules and pathways; consulted for Inception 5 Sciences; received research support from Novartis Pharma OCTIMS, Inception Sciences, the NINDS, the NIA, the National MS Society, the Sherak Foundation, and the Hilton Foundation; and served as an expert witness of Mylan Pharma vs Teva Pharma. S. Hauser served on the scientific advisory board of Symbiotix, Annexon, Bionure, and Molecular Stethoscope; serves on the board of trustees of Neurona; received travel funding and speaker honoraria from F. Hoffman La Roche; receives publishing royalties from the McGraw-Hill Education, provided writing support for F. Hoffman La Roche; received research support from the NIH, National MS Society, and Conrad N. Hilton Foundation. R. Bove served on the scientific advisory board of Roche-Genentech, Sanofi-Genzyme, and Novartis; received gifts from the Sherak Foundation and Akili; has a patent pending for Selective estrogen receptor modulators and remyelination; and received research support from the California Initiative to Advance Precision Medicine, National MS Society, and Hilton Foundation. Full disclosure form information provided by the authors is available with the full text of this article at Neurology.org/NN. Accepted in final form February 9, 2018.
. Glatiramer acetate during early pregnancy: a prospective cohort study. Mult Scler J 2016;22:810–816.
. Interferon-beta exposure during first trimester is safe in women with multiple sclerosis—a prospective cohort study from the German Multiple Sclerosis and Pregnancy Registry. Mult Scler J 2016;22:801–809.
. Management of multiple sclerosis during pregnancy and the reproductive years: a systematic review. Obstet Gynecol 2014;124:1157–1168.
. Rate of pregnancy-related relapse in multiple sclerosis. Pregnancy in Multiple Sclerosis Group. N Engl J Med 1998;339:285–291.
. Neurology & Psychiatry Editorial Pregnancy in multiple sclerosis. J Neurol Neurosurg Psychiatr 1993;56:1043–1045.
. Immunology of neuromyelitis optica during pregnancy. Neurol Neuroimmunol Neuroinflamm 2016;3:e228. doi: 10.1212/NXI.0000000000000228.
. Neuromyelitis optica and pregnancy. J Neurol 2013;260:2614–2619.
. Catastrophic outcome of patients with a rebound after natalizumab treatment discontinuation. Brain Behav 2017;7:1–6.
. Considerations on discontinuing natalizumab for the treatment of multiple sclerosis. Ann Neurol 2010;68:409–411.
. Recurrence or rebound of clinical relapses after discontinuation of natalizumab therapy in highly active MS patients. J Neurol 2014;261:1170–1177.
. Immune reconstitution inflammatory syndrome in patients with multiple sclerosis following cessation of natalizumab therapy. Arch Neurol 2011;68:186–191.
. Recurrence of disease activity during pregnancy after cessation of fingolimod in multiple sclerosis. Mult Scler Epub 2017 Sep 1:1352458517731913.
. Rebound of disease activity during pregnancy after withdrawal of fingolimod. Eur J Neurol 2013;20:e109–e110.
. Dramatic rebounds of MS during pregnancy following fingolimod withdrawal. Neurol Neuroimmunol Neuroinflamm 2017;4:e377. doi: 10.1212/NXI.0000000000000377.
. Relapse occurrence in women with multiple sclerosis during pregnancy in the new treatment era. Neurology 2018;90:e840–e846.
. Rituximab pharmacokinetics in patients with rheumatoid arthritis: B-Cell levels do not correlate with clinical response. J Clin Pharmacol 2007;47:1119–1128.
. Rituximab versus fingolimod after natalizumab in multiple sclerosis patients. Ann Neurol 2016;79:950–958.
. Preferred reporting items for systematic reviews and meta-analyses: the PRISMA statement. Preferred reporting Items for systematic reviews and meta-analyses. BMJ 2010;8:b2535.
. Inefficacy of plasma exchanges associated to rituximab in refractory obstetrical antiphospholipid syndrome. Press Medicale 2015;44:100–102.
. Pregnancy outcomes in women with rheumatoid arthritis ever treated with rituximab. Rheumatology (Oxford) 2017;56:661–663.
. Rituximab, cyclophosphamide, doxorubicin, vincristine, and prednisone (R-CHOP) chemotherapy for diffuse large B-cell lymphoma in pregnancy may be associated with preterm birth. Obstet Gynecol Sci 2014;57:526–529.
. Safety of rituximab therapy during twins' pregnancy. Rheumatology 2011;50:806–808.
. Antigenic burden and serum IgG concentrations influence rituximab pharmacokinetics in rheumatoid arthritis patients. Br J Clin Pharmacol 2017;83:1773–1781.
. Update on overall prevalence of major birth defects –- Atlanta, Georgia, 1978–2005 (online). 2008. Available at: cdc.gov/mmwr/preview/mmwrhtml/mm5701a2.htm. Accessed July 9, 2017.
. Update on reproductive safety of current and emerging disease-modifying therapies for multiple sclerosis. Mult Scler J 2013;19:835–843.
. Neonatal pancytopenia in a child, born after maternal exposure to natalizumab throughout pregnancy. J Gynecol Obstet Hum Reprod 2017;46:301–302.
. Disease activity return after natalizumab cessation in multiple sclerosis. Expert Rev Neurother 2016;16:587–594.
. Disease activity following pregnancy-related discontinuation of natalizumab in MS. Neurol Neuroimmunol Neuroinflamm 2018;5:e424. doi: 10.1212/NXI.0000000000000424.
. Ocrelizumab in relapsing-remitting multiple sclerosis : a phase 2, randomised, placebo-controlled, multicentre trial. Lancet 2011;378:1779–1787.
. Pregnancy outcomes following ocrelizumab treatment in patients with multiple sclerosis and other autoimmune diseases. Presented at: 2017 Annual Meeting of the Consortium of Multiple Sclerosis Centers; May 24-27, 2017; New Orleans, LA. Available at: https://cmsc.confex.com/cmsc/2017/webprogram/Paper5011.html. Accessed March 13, 2018.
. Treatment of cancer during pregnancy with monoclonal antibodies: a real challenge. Expert Rev Clin Immunol 2010;6:821–826.
. Single-agent rituximab for primary CNS lymphoma during pregnancy as a bridge to definitive management. J Clin Oncol 2014;32:e14–e17.
. Treatment of hairy cell leukemia during pregnancy: are purine analogues and rituximab viable therapeutic options. Clin Lymphoma Myeloma Leuk 2013;13:86–89.
. Rituximab plus CHOP for treatment of diffuse large B-cell lymphoma during second trimester of pregnancy. Lancet Oncol 2006;7:693–694.
. Safety of rituximab therapy during the first trimester of pregnancy: a case history. Eur J Haematol 2004;72:292–295.
. B cell suppression in newborn following treatment of pregnant diffuse large B-cell lymphoma patient with rituximab containing regimen. Indian J Pediatr 2014;81:1092–1094.
. Primary Mediastinal large B-Cell lymphoma during pregnancy. Case Rep Hematol 2012;2012:197347.
. Rituximab combined with chemotherapy for lymphoma during pregnancy. Leuk Res 2009;33:2008–2009.
. Pregnancy in a patient with primary Membranous nephropathy and circulating anti-PLA2R antibodies: a case report. Am J Kidney Dis 2016;67:775–778.
. Rituximab for management of refractory pregnancy-associated immune thrombocytopenic purpura. J Obstet Gynaecol Can 2010;32:1167–1171.
. Fetal outcomes after rituximab exposure in women with autoimmune vasculitis. Ann Rheum Dis 2015;72:2051–2053.
. Rituximab for prevention of recurrent pregnancy related thrombotic thrombocytopenic purpura in high risk patients with previous episodes of thrombotic thrombocytopenic purpura during pregnancy. Blood 2016;128:4940.
. Modified neonatal B-cell repertoire as a consequence of rituximab administration to a pregnant woman. Rheumatology (Oxford) 2013;52:405–406.
. Successful pregnancy after rituximab in a women with recurrent in vitro fertilisation failures and anti-phospholipid antibody positive. Ir J Med Sci 2009;178:531–533.
. Administration of rituximab during the first trimester of pregnancy without consequences for the newborn. J Perinatol 2006;26:252–255.
. Exposure to abatacept or rituximab in the first trimester of pregnancy in three women with autoimmune diseases. Clin Rheumatol 2013;32:695–700.
. Course of neuromyelitis optica during inadvertent pregnancy in a patient treated with rituximab. Mult Scler 2009;15:1006–1008.